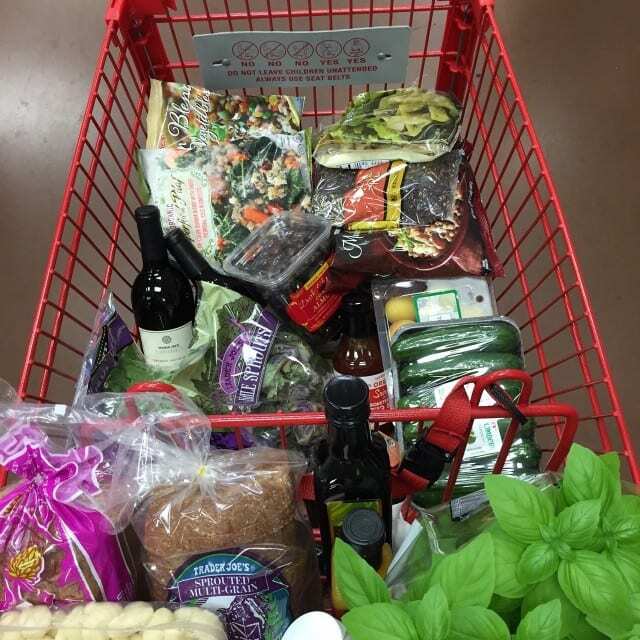 So I finally got myself to Trader Joe’s. I have my sister-in-law Paula (and my father-in-law, pictured above walking in – isn’t he cute?) to thank for getting me there, not sure what’s taken me so long. Our TJ’s opened up in our area last summer and I just haven’t gotten around to stopping in, primarily because it’s a little out of my way. Now that I know what’s inside those doors, I will definitely make the time to get myself there a little more often. 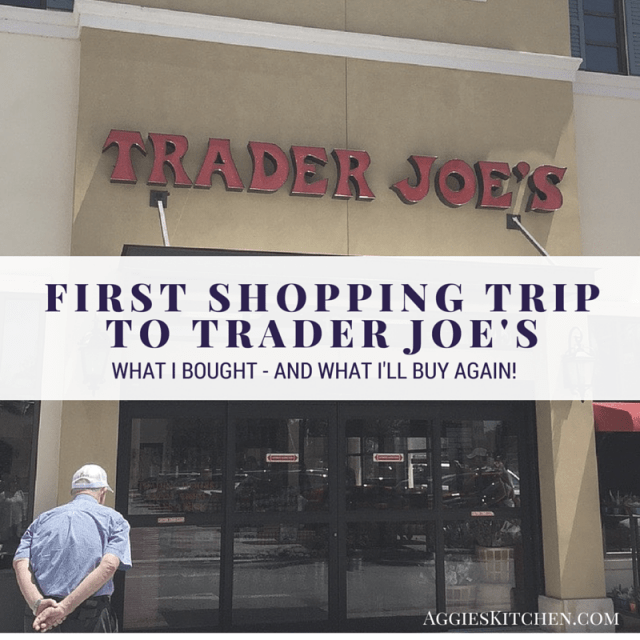 I have to admit, I was a little overwhelmed by all the hype of Trader Joe’s and did not know what to expect at all with my first shopping there. All I know is after asking what I should buy on my Facebook page, I find that people are pretty passionate about their cookie butter. I hate to disappoint (and am almost afraid to admit out loud), but I went home without cookie butter (totally by choice – I seriously DO NOT need it in my house!). I did come home with an incredible haul thanks to great suggestions by my sister-in-law as well as a ton of responses on Facebook. I was pleasantly and completely surprised at how awesome Trader Joe’s produce department was. Like selection and price awesome. 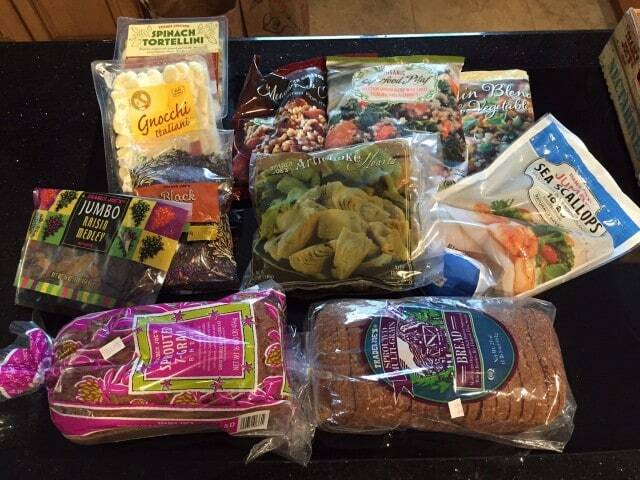 Every single fruit and veggie I bought was absolutely delicious. I can’t stop thinking about those Angelcots (white apricots), adorable kale sprouts, Persian cucumbers and (organic) Tuscan kale. The nectarines and plums were amazing and so sweet. I felt like a kid in a candy store and could pretty much shop there every week if I could. I had to calm myself down and not buy more than we could eat. I was also surprised by the bread section at TJ’s, specifically the sprouted grain breads. The price was great and I brought home a couple of loaves and kept them in the freezer, pulling out a slice or two at a time as needed. I’ll definitely be grabbing a few loaves next time. My friend Mary recommended the jumbo raisin medley and I am so glad I grabbed a bag, these are not your typical raisins people – not even close. Get yourself some and thank me (and Mary) later. I enjoyed the frozen Superfood Pilaf but will probably pass on buying it again, only because I think I can make it myself just as quickly and easily as heating it up from freezer. My kids loved the tortellini and gnocchi (as I knew they would) and I have yet to cook up the scallops or frozen artichokes. My sister-in-law loves their Mushroom Risotto (also in the freezer section). Can we talk about how giddy happy I was when I left the store? Not only was I completely happy with everything I bought and have tried so far, but I honestly was so impressed with the store itself as well as the employees working there. I am a question asker when I am shopping and loved how friendly and conversational everyone I talked to was, including the employee who went above and beyond talking to me about their teas and even taught me a new way to drink my tea (cold brewing, have you tried it?). Fun shopping trip for me! So, what did I miss? What TJ’s item can you not live without? TJs is so much fun! I love their dried/freeze dried fruit and nuts. They have great kiddo snacks too (Kaylin is a big fan of their rocket ships). LOVE their unsalted Almond Butter. I also have not tried the cookie butter as I don’t want it in my house ;). They have a few great salad mixes too. Soyaki sauce is amazing! Marinate chicken in it and then brush it on while you grill the chicken! I will check out this sauce, thank you! Sounds delicious on grilled chicken. They have good prices on flowers too! I’m stocking up on their tortillas next time and putting some in the freezer, they were so good! Chocolate covered sale graham cracker cookies and babk!a, they have a great cheese selection too. Yay! So nice of you to post this. There are many things I like about Trader Joe’s and am so happy they came to my neighborhood! I am trying the mushroom ravioli as was suggested to me by a loyal customer. Also, if you haven’t had enough recommendations, the frozen Quinoa is delicious! I love food/cooking/baking and nice grocery stores!!! I really appreciate nice grocery stores! That mushroom ravioli sounds delicious. 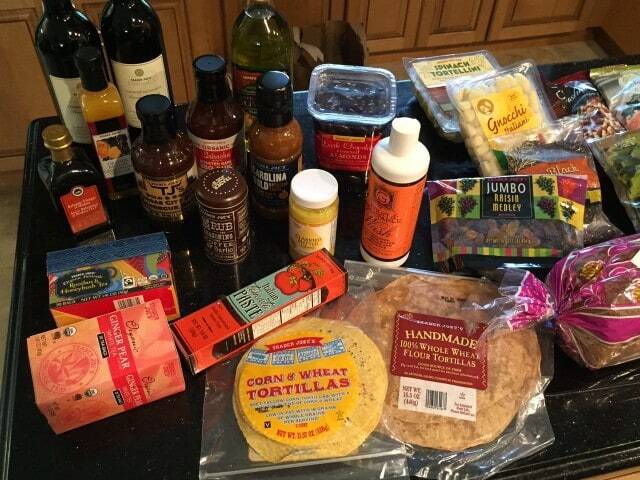 I love Trader Joe’s too! We got one just this year in our area and I love that we live so close. There are so many products I have yet to try. I love the fruit and veggie wash–I saw you post a picture of it on Instagram and it’s the best veggie wash I’ve used. Some other products I love are the Fleur de Sel Caramels (impossible to eat just one! ), Fig & Rosemary crackers (a little pricey for the small box but worth it if you want to put out a delicious cracker for a nice dinner party appetizer plate), the multigrain tortilla chips (so! good!). Last week, I bought their frozen brown rice (I really hate cooking brown rice–takes forever and mine always turns out too sticky) and the frozen mandarin chicken, both of which I have to try, but I heard an employee recommend the chicken over and over again. Yay for TJ’s! That veggie wash has been great. I have so much to try and I’ve also heard good things about that chicken. Those crackers sound SO good! The coconut covered cashews are a must!!! And the Hot and Sweet Mustard. To die for!!! we are mustard people – MUST get that! I LOVE the Kansas City BBQ sauce. And pretty much every bottled sauce at TJ’s. Minimal ingredients and they are very useful during a dinnertime pinch. 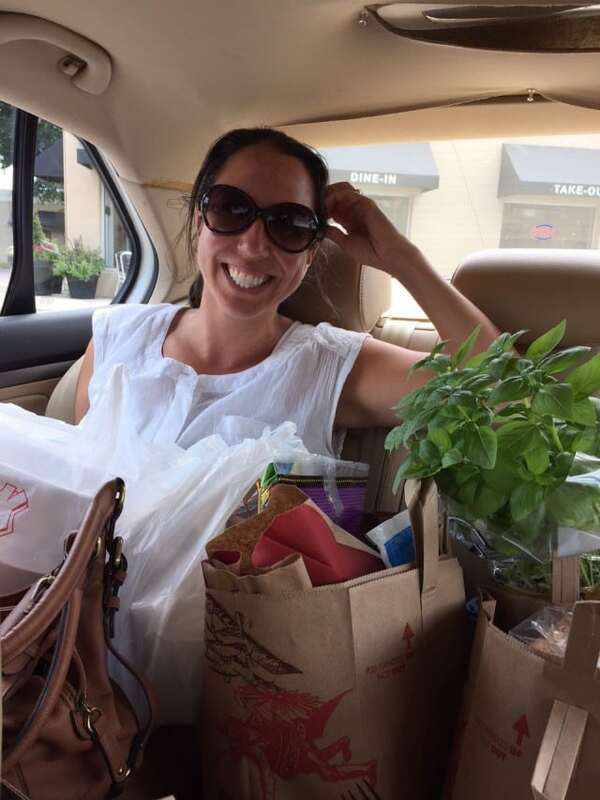 I love the picture of you with all the goodies in the car. Happy happy!!! That’s how I feel every time I leave the store too lol! The Trader Joe’s 72% Cacao Dark Chocolate bars…my FAVE dark chocolate, and I’ve tried a lot! I will have to try those! I love a good dark chocolate bar to have around for a taste after dinner. Thank you for letting me know! Flowers and cards – check! I don’t think I even looked through that area. I can’t’ wait for my next trip. I cannot leave the store without the dark chocolate coconut almonds……. Seriously, I could eat the whole container myself! The dark chocolate almonds with sea salt are pretty darn good too! I can’t say enough about how addicted I am to their Dark Chocolate covered Almonds with Sea Salt and Turbinado Sugar…dark chocolate and almonds are a health food, right? Oh, and the Trader Giotto’s Rustic Rosemary and Sea Salt Flatbreads – wonderful crackers that are perfect to serve with a triple cream soft cheese like St. Angel – heavenly! I love TJ’s but since our move the closest one is 45 min. away. I still go just not as often. Cranberry Dunkers (cookie) are our favorite TJ’s cookie. I also love their Tamales. It is a fun store since they have such a variety of things. Glad you found it. Happy shopping! it really is a fun store. I couldn’t believe how much they had. I’m intrigued by the tamales. are they frozen? Frozen green beans and edemame, spicy peanut Asian salad dressing, one pound dark chocolate bars!!! that salad dressing sounds so good! And a one pound dark chocolate bar – yes please! In my area, I find that their butter, cream cheese, cheese in general, and stocks are lower priced than my regular grocery store. I am also obsessed with their canned light coconut milk, black bean-quinoa tortilla chips, the chocolate cupcakes filled with peanut butter, toasted coconut cookie thins, and definitely get their pound plus chocolate for all your baking and melting needs.I’m sure there is more I am not thinking of at the moment. You must try the cilantro lime chicken burgers. (Frozen) The best!! Oh those sound so good! will look for them! so much to check out, thank you for sharing! Just went yesterday, myself. 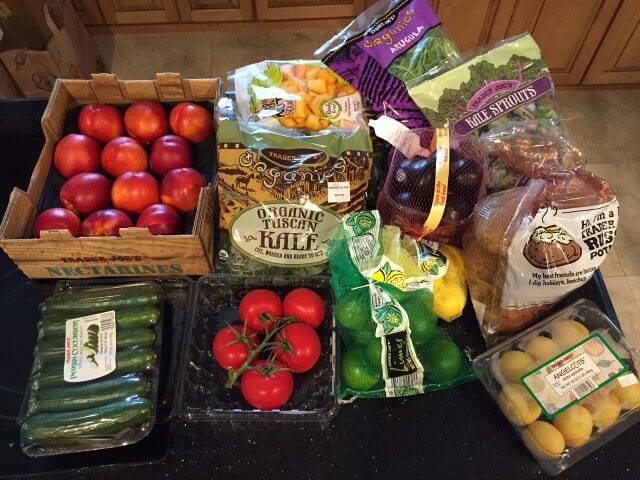 I have had great experiences with all the fruits & veggies. Also, great cheese department with better prices than any grocert stores. I always pick up the olive bread & extra for the freezer. My favorite though has to be the greek eggplant. It is in a can but great on top of homemade ricotta on olive bread, pasta & a twist for eggs in purgatory. I keep hearing their cheese are great. That Greek eggplant sounds amazing, I will have to look for it. Great ideas on how to use it! thanks for sharing, will check it out! Their soyaki sauce is crazy good. If I need a quick meal I’ll make some organic ramen and broccoli in water, then drain it and add some soyaki. Oh I have to look for that, sounds great! No, the tamales are not frozen. They are over by the cheese, meat area. They formerly only sold them in December and only until they sold out. They sold out within days. My store now has them year round. I put them in the freezer for an easy last minute lunch. The Mediterranean smooth and creamy hummus and Original Savory thin and mini crackers (sesame) are a weekly staple in our home. My heart would break is they ever discontinued them!! I’ve heard their hummus is really good!! And thanks for letting me know about their taco seasoning – will check out! I love that you wrote this post, Aggie! I’m all about shopping posts 🙂 We have TJ’s all over the place here in Northern CA and there’s one just minutes from my house which I love because it’s easy to just pop in for one or two items. I’m going to grab those raisins next time for my granola. I keep a regular stock of their raw almonds and cashews and a variety of other nuts and dried fruits. You can’t beat their prices on those items. I love their Cilantro Jalapeno Hummus (all of their hummus is really good) and they have good prices on items like prosciutto and goat cheese in more practical sizes than what is available at Costco. Then there’s the booze 🙂 Pretty good selection and excellent prices. Now I want to go shopping! I absolutely LOVE TJ’s and the closest one to me is 2 hours away. My sister and I take road trips and fill up the car with TJ’s. There’s nothing I’ve tried that I didn’t like. However, THE BEST, by far Is the Kitchen Clothes. They are wonderful!!! They are like a chamoise you know what you use to dry your car off with after you’ve washed it. I’ve given the Kitchen Cloth to all of my friends and they keep asking me for more.